The Zendesk Chat app allows you to provide chat support from your Android device. Once you've installed the app, you can configure how it works on your device using the options described below. Service notification icon: Make sure the Zendesk Chat app remains running in the background by having a persistent notification in the notification drawer. We recommend keeping this setting turned on to prevent the OS from interrupting the delivery of notifications. Push notifications: Keep the app connected during bad connectivity and to decrease the battery usage. Incoming visitor notifications: Get notified whenever a new visitor enters your site/page with the widget embedded on it. If you have a high-traffic site, this can cause the app to consume more battery life. Chat request notifications: Get notified whenever a visitor starts a new chat. New chat request notifications will be fired for every message until an agent joins the chat. 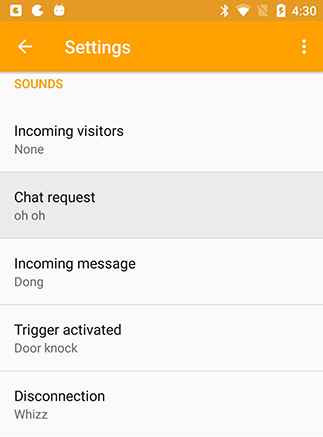 Customize the sounds that play for notifications of different chat events, like an incoming message or when a trigger is activated. You can also configure your device to vibrate or flash the LED notification light (if it has one) when you get a notification. Keep in mind that your device's overall notification and interruption settings will override Zendesk Chat specific settings if they conflict. Tap the menu icon (≡) and select Sounds. Incoming visitors: Plays when a new new visitor arrives to the website or page with the Zendesk Chat widget embedded on it. This sound plays only if you've enabled Incoming visitor notifications, as described above. Chat request: Plays when a visitor starts a new chat. This sound will also play for each subsequent visitor message until an agent joins the chat. This sound plays only if you've enabled Chat request notifications, as described above. Incoming message: Plays when there's a new message in one of your chats. Trigger activated: Plays whenever a trigger runs on a chat or visitor. For more about triggers, see X.
Disconnection: Plays if the app becomes completely disconnected and has been unable to reconnect. Select a sound for the event from the available options. Tap the menu icon (≡) and select Settings. In the Preferences section, enable one or both of the LED notification and Vibrate options. In the Preferences section, enable the Auto-run option.